Leopard print is everywhere at the moment. It’s become almost as ubiquitous with 2018 as this never-ending heatwave. But the best way to stop yourself getting sick of spots is to change up the color, like Gaia. Also, choose a blown-up print, rather than compact — and the cherry-red background of this dress keeps it fresh. 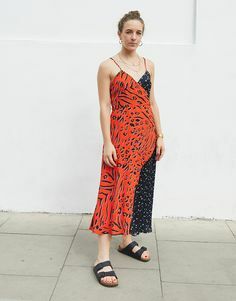 Likewise with the contrast print on this simple slip — mixing it up nails two trends in one: animal and pattern clash.